Ottawa-based energy analyst Stephen Aplin has taken on a portion of the work the Ontario government never did: an analysis of the benefits of wind power as part of Ontario’s power mix. This week, with temperatures well below normal, is wind power achieving the promises made for it as a cheap reliable source of power? 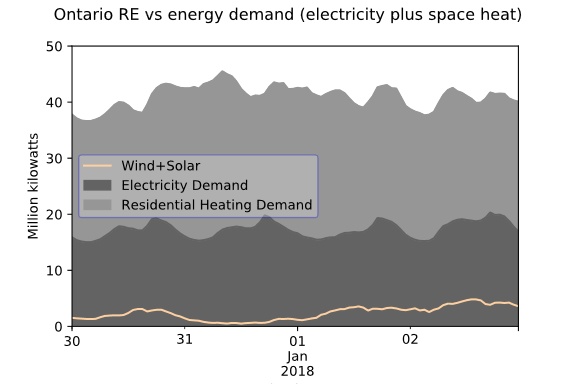 Even if Ontario had ten times the capacity of wind and solar it does now, it still wouldn’t meet demand. Aplin concludes by despairing of the renewables myth. “In light of this, another monster-size question is begged. Why do governments all across the world regularly and routinely regurgitate the 100 percent renewables myth? Sure this panel will back up the myths of 100% renewables and the libs will press forward with their planet saving green agenda!!! Wondering if this panel is intelligent and independent enough to recognize the wrong geological map was used in Chatham Kent water well issue…. if not then… at the very least this panel will be compensated well!!! Nothing can be proven until something happens to prove otherwise ! And when it is proven then we shall ignore it unless it benefits our agenda!!! Including the agendas of international organizations? Ridiculousness!!!! Wake up people!! Make this hydro giveaway an ellection issue!!! A big one!! Surely this government is going to have to make ‘the necessary changes’ to accommodate the reality of this ridiculous mess. Check out this piece out of Duluth. Another Liberal experiment on the good folks of Ontario!!??? We just can’t seem to get the money flow stopped! There is a mountain of bona-fide data on these IWT’S covering over ten years. Mayors, Accountants, Tradesman, CEO’s, Electrical Engineers, Power Workers and many others have provided factual data to the McGuinty and now Wynne governments and still they promote their for profit propaganda. IWT’S are for the generation of wealth power not for the generation of electrical power. Another year has passed and the money still flows to those who will stoop low enough to take it and think, “tahell with the planet give me the cash”. Providing real-time, real data, from real windmills and solar farms is not working to help stop this nonsense. From our experiences with off grid set-ups, it figures to between 400 and 500 dollars per month for diesel or propane generation to a single residence with some inconvenience and much less initial cost than solar or turbine. Some homeowners, who have always been on hydro and nuclear, now are on fossil because of the spiraling out of control costs. Rents are controlled in Ontario but not the cost of hydro to the owner. So they take the loss. The type of renewables being implemented now are a losing situation regardless of how anyone spins it. And I can prove that! Unfortunately only 208 people signed that petition there Sommer….. what came of the investigation??? Hey, green energy people, during the last hour of today, Jan. 15, 2018, 10pm to 11pm, all the windmills in Ontario provided 780mw. It is -20 at 11:33pm with a severe north wind. The grid is demanding 22,000mw. The gas plants to supply back up for the non producing windmills are topping out at 4980mw. Imagine the CO2 and other green house gases being generated during this cold weather just for the windmills. There is no good way to spin this, it is simply a waste and burden on the grid. If I could I would shut down the windmills and their supporting gas plants at least until the severe cold has passed. We were exporting 4008 MW to NY, Michigan and Quebec during that hour and were being paid about $65/70/MWh so maybe IESO was trying to earn a little extra. Gas generation only costs us slightly more than the fuel costs of generation (they are guaranteed prices per MW of capacity under their contracts) so it might have been an honest effort on IESO’s part to lessen the burden on Ontario’s ratepayers. We should allow them 1 hour out of the 8760 hours in a year to actually keep the GA in check. Too bad they couldn’t do the same for the other hours too.